This $5,000 buy-in event is going to packed with tournament poker stars and amateurs alike. So far there are several players we recognize who fall into the former category, including Jeremy Ausmus, Justin Young, David ‘Doc’ Sands, Shannon Shorr and Ryan Hughes, who cashed 16 times at the World Series of Poker this Summer. Also in the field is Adrian Mateos Diaz, who became the youngest player ever to win three WSOP bracelets when he won the $10,000 heads-up no-limit hold’em championship this summer at the age of 22. On a flop of 9 7 3 , Kevin MacPhee bet 3,500 and Adrian Mateos called. The turn was the 7 and MacPhee checked. Mateos then threw in his big denomination chips, effectively betting enough to put MacPhee and his last 16,000 to the test. Eventually, MacPhee opted to save the last of his stack, and Mateos chipped up to 39,000. Adrian Mateos is a two-time bracelet winner with over $5 million in live tournament earnings. The 21-year-old Spanish poker pro won the 2013 WSOP Europe main event for €1 million and then captured his second WSOP title this summer in a $1,500 no-limit hold’em event. Now he has joined the field here on day 1B of the 2016 Card Player Poker Tour Venetian DeepStack Extravaganza $5,000 no-limit hold’em main event. Adrian Mateos raised to 3,500 from the hijack and Chris Oliver called from the button. Mike Matusow defended his big blind and the flop came out 6 5 4 . It check to Oliver, who bet 4,800. Matusow folded and Mateos made the call. The turn brought the ! and Mateos check-called a bet of 10,500 from Oliver. The K on the river prompted checks from both players and Mateos showed the A Q .
Oliver mucked his hand and Mateos raked in the pot, increasing his stack to 340,000 to make him one of the chip leaders midway though day 2. A short-stacked Adrian Mateos got all in preflop with the AcA against Ilan Boujenah’s Q Q . The board came down J 10 3 6 9 and Mateos doubles to 380,000. Boujenah still has 800,000 after the hand. Adrian Mateos got all-in preflop for 299,000 with the Q Q up against Brendon Rubie’s J J . The board ran out A A 7 2 K and Mateos pocket queens held up to earn him the double up. He now sits with 620,000 while Rubie has fallen to just 160,000. Adrian Mateos and Koray Aldemir got it all-in on a board of K Q 4 2 with Mateos holding 8 9 for a flush draw and Aldemir holding K-2 for two pair. 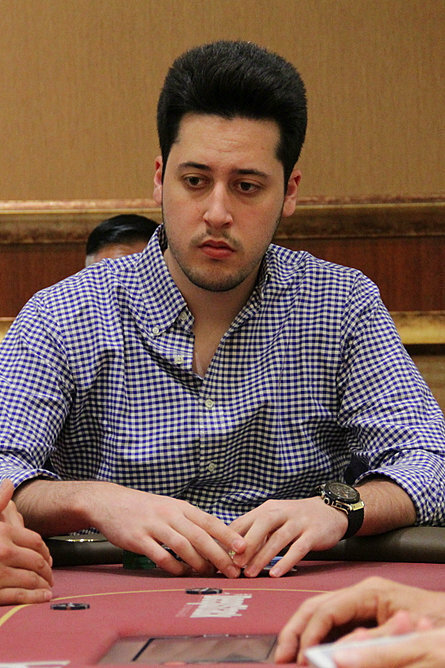 The river was the A and Aldemir was eliminated, bringing the field to the final four tables.